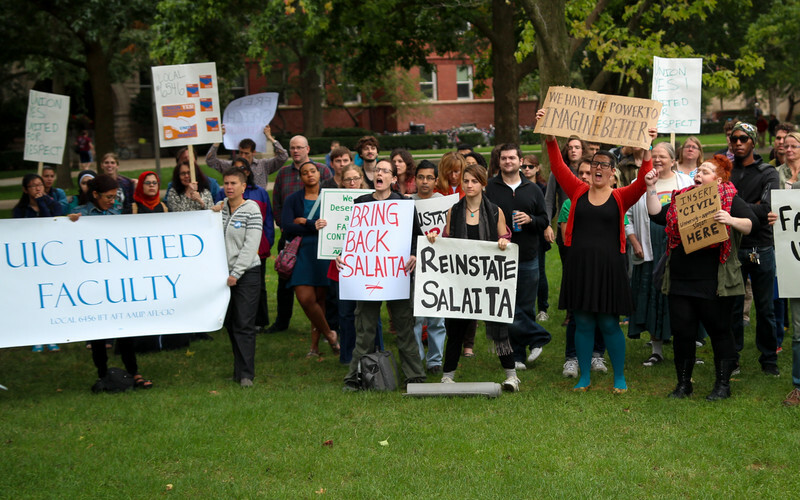 TAKE ACTION: Demand that UIUC Reinstate Dr. Steven Salaita NOW! USPCN demands the immediate reinstatement of Palestinian American professor Dr. Steven Salaita, and calls on all its members, and people of conscience across the country and world, to again resist the violations of academic freedom that have become commonplace in the U.S.
Students protesting Steven Salaita's dismissal at the University of Illinois at Chicago. USPCN demands the immediate reinstatement of Palestinian American professor Dr. Steven Salaita, and calls on all its members, and people of conscience across the country and world, to again resist the violations of academic freedom that have become commonplace in the U.S. The University of Illinois-Urbana-Champaign (UIUC) must hear from every single one of us, and must know that our brother Dr. Salaita has an entire community that supports him. UIUC’s firing of Dr. Salaita translates into support for Israel’s racism, occupation, and reaction, especially now, while Israel is on another murderous rampage against our people. has been FIRED by the University of Illinois (don’t let them call it just “declining to hire” – Steven had a signed contract and had relied on it to quit his prior faculty post, obtain housing and childcare, etc) because of his tweets and public activism about the Israeli assault on Gaza and Palestine. Please also copy Robert Warrior, chair of the Department of American Indian Studies (which has supported Salaita’s hiring) and the Department itself on your letter: Robert Warrior, - American Indian Studies, . The department must know that Professor Salaita has support!